This PowerPoint was created to accompany the daily 3rd grade Saxon Phonics Grade 3 lesson 3. I am offering it as a freebie, so you can see if this format would be helpful for you.. These PowerPoints will allow you to have the boardwork and sentences displayed quickly, to provide you the ability to focus more on the instruction. PowerPoints will be added in weekly groupings with the entire set available soon. Click here to see the first set of lessons! 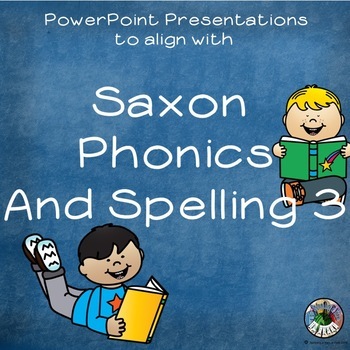 These materials were prepared by an individual teacher and have neither been developed, reviewed, nor endorsed by Houghton Mifflin Harcourt Publishing Company, publisher of the original SAXON PHONICS AND SPELLING 3 work on which this material is based.